Home > Our History > The Luther Sculpture. 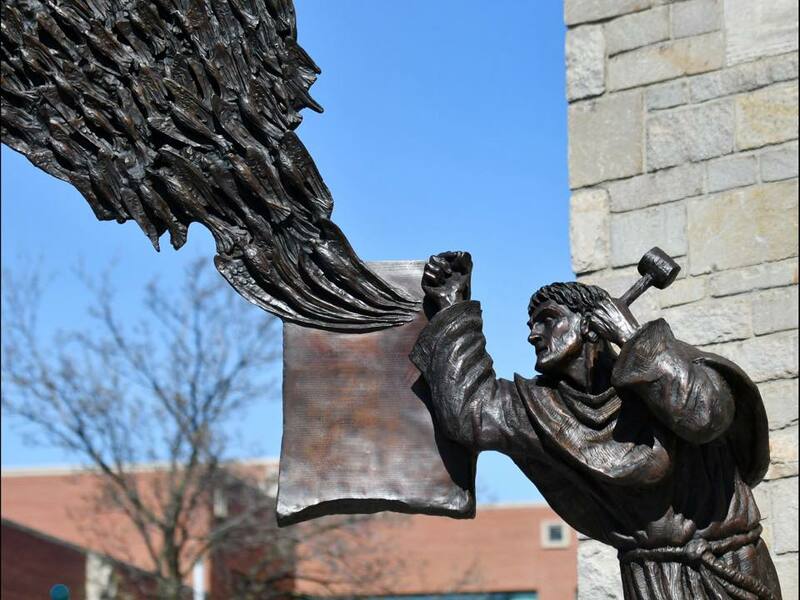 Historic Trinity’s Martin Luther sculpture was dedicated on April 29, 2018 to commemorate the 500th Anniversary of the Reformation (October 31, 2017). The idea of the sculpture was originally inspired by the dedication of Luther Square in Rome, a newly designated plaza on Viale Fortunato (Blessed Avenue), dedicated on September 15, 2015. The small and humble sign reads “Piazza Martin Lutero, teologo tedesco de la Riforma (1483-1546)” (Martin Luther Square, German theologian of the Reformation). 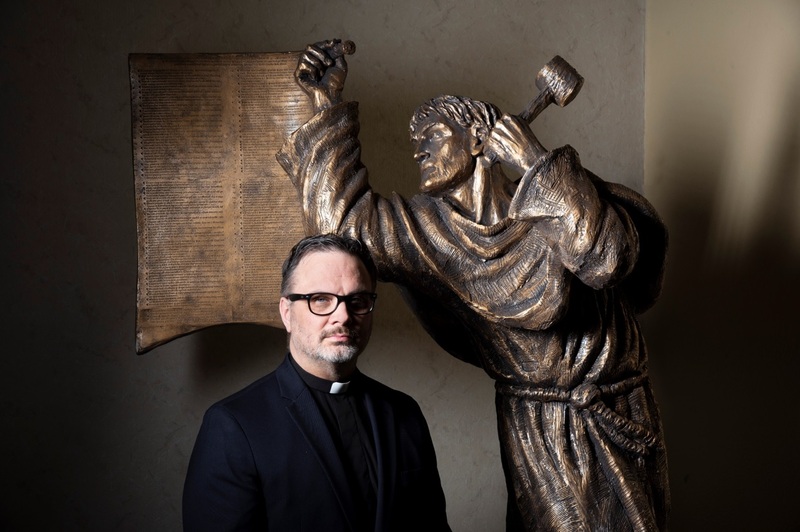 The concept was initiated by the leaders of the protestant groups in Rome to have a sculpture of Luther created by Canadian artist Timothy Schmalz, who has created more than five Gospel based sculptures permanently installed in some of the most significant sacred spaces in the Eternal City including the Vatican, St. Peter in Chains, St. Paul’s Basilica and San Lorenzo in Lucina. Original sketches were shown to Rev. 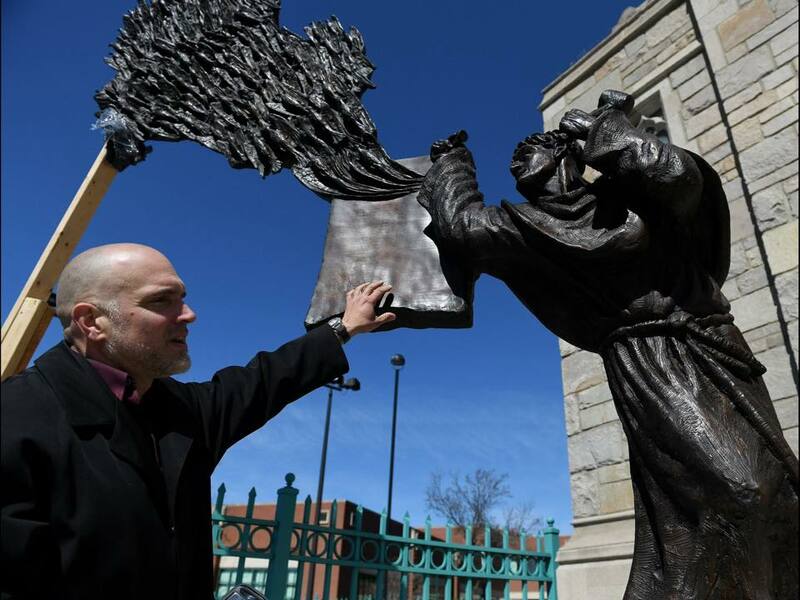 D. Lee Andrzejewski in October 2015, while an agreement to place this sculpture in Detroit was made in October 2016. Schmalz began sculpting in December 2016 with the goal of placement for the 500th anniversary celebration. For such a momentous occasion, the Mother Church of Lutheranism in Detroit raised the funding for this sculpture in a matter of months. However, the sculpture proved to be an engineering challenge as the weight of the sculpture’s most striking feature—95 doves—extended far beyond the base. What was intended to be a six-month creation, took nearly nine months, as structural engineers were employed to provide design features relative to flight of the doves. Further delays in customs, Historic Commission approval, city permits, and seasonal limitations moved the dedication from October 29, 2017 to April 29, 2018. Publications such as Life Magazine identified Luther’s posting of the 95 Theses as the third most significant event in the second millennium AD. The Reformation was not merely a moment, but clearly a movement that sparked a renaissance in worship, education, music, and certainly theology. The courage and passion of Martin Luther has inspired such notable civic leaders as Rev. Michael King, Sr., pastor of Atlanta’s Ebenezer Baptist Church in 1934, who was so moved by the Reformer’s ministry that he changed his name, and that of his five-year-old son, Michael, Jr. to reflect this admiration. His son would from then be known as Martin Luther King, Jr. This grand work of art is fashioned to capture the very moment of Luther’s posting of the 95 Theses on the door of the Castle Church in Wittenberg. 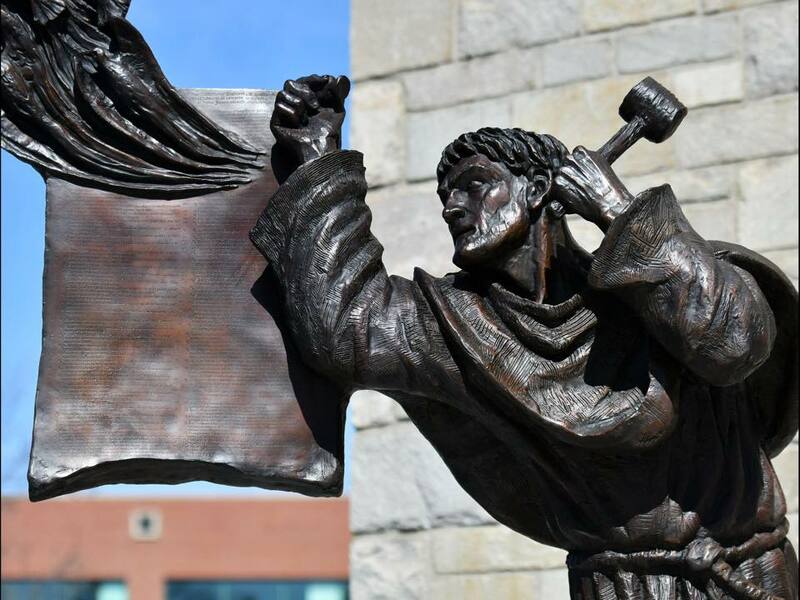 In his right hand, the Augustinian monk is holding the theses (Thesis Number 1: When our Lord and Master Jesus Christ said, “Repent” (Mt 4:17), he willed the entire life of believers to be one of repentance). In his left hand, he is swinging the hammer. By this artistic positioning, Schmalz articulated the balance of the law (hammer) and the gospel (See Thesis #36: Any truly repentant Christian has a right to full remission of… guilt, even without indulgence letters.). The law is in Luther’s weaker hand, the gospel in his strong hand. The sculpture has been placed so the doves can be seen against the backdrop of the downtown skies as a further call toward the spread of the gospel. Luther’s face is focused and determined. His strong jawline resembles that of Michelangelo’s David sculpture in 1504. His body is strained and his torso is twisted to demonstrate Luther’s resolve. Historic Trinity was founded in 1850 in the Eastern Market District (originally called “Germantown”) of downtown Detroit. The Rev. Johann Schaller (1850-1854) was sent as the first pastor of Trinity on November 10, 1850. Trinity affiliated with the new Missouri Synod (est. 1847) and became the Mother Church of the Missouri Synod in Detroit. Services were held in the chapel of Christ Episcopal Church at Jefferson and Hastings. The congregation then purchased the chapel of the Western Seaman’s Friend Society of Woodbridge Street from the Mariners Church (Episcopal), and moved it to Rivard and Larned as its first church building. The current sanctuary was constructed during the Great Depression and dedicated in 1931. Between the 155 years of 1860-2015, Trinity was served consecutively by only four pastors (Rev. Huegli, 1860-1902; Rev. T. Otte, 1902-1927; Rev. G. Otte, 1927-1983, and Rev. Eberhard, 1983-2015). Rev. Andrzejewski (2015-) is only the fifth head pastor at Historic Trinity since Abraham Lincoln’s first year of presidency. Timothy Schmalz is a figurative artist whose sculptures can be found all over the world. His Matthew 25 series has been placed in more than 20 historic cities, including Rome, Westminster London, Madrid, Singapore, Capernaum, and Santo Domingo. His “Whatsoever you do” sculpture was placed at Historic Trinity in 2016. The magnificent 4500 lb. granite statue base was manufactured from materials quarried in the Karimnagar District, State of Telengana, India. This granite block was shipped to Fujian Province located on the southeast coast of China for processing near the seaport town of Xiamen. The final stop on its journey for finishing was in the town of ChongWu, known as the “granite carving Capital of the world” where skilled craftsmen have been producing items made from granite for thousands of years. After the materials were fabricated, hand shaped, hand polished and packaged, the multiple pieces were shipped to Columbus Memorials in Columbus, Ohio for delivery and installation at Historic Trinity Lutheran Church on April 28, 2018. Learn more about the Lutheran faith.